Steve Saunders Goldwing Forums > Forums > General Motorcycle Discussion Forum > What did you do to your Wing today? John, looks like you need to put a sidecar on your '02, get in and let Cindy drive you around the countryside. AZgl1800 and OldSchool_IsCool like this. AZgl1800, Bike...and Dennis and Dirt Road Cowboy like this. can you say Paint got rubbed? Kind of early to be heading back, isn't it? But it’s all good. The cool part is you just drive the bike in, stuff the wife’s cloths around it and your off. Don’t need to bother with tie downs. Heading back now cause my landlord won’t rent me an extra couple of weeks, wants to come down and golf. Since my shoulder is all screwed up, I am not going to risk riding the bike. So, as it has been sitting all winter, I fired it up today and let it run until the fans cycled several times..... and put her back to sleep. for a bite to eat. Bike Night will start there on Thursdays in two weeks, but tonight there were only two of us. Most people won't ride if they think there is the slightest chance of rain. But the food was good, and I spent some time chatting with the one other brave soul who showed up. There is nothing quite as much fun as swapping lies with another diehard biker! with her crap in a shopping cart. Back in the cold Central Wisconsin spring. 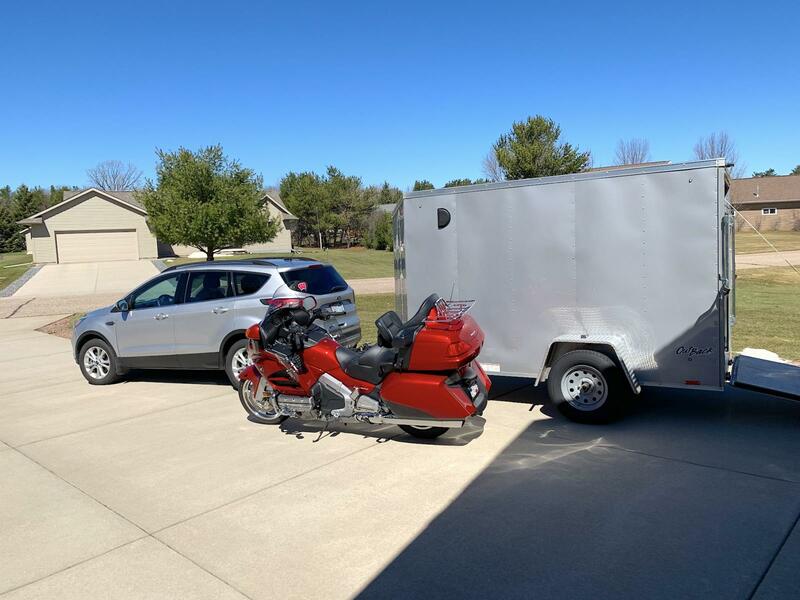 Winter motorcycle travels, 4,000 miles on two wheels, plus 4,000 miles in the cargo trailer. Last winter was 8,000 miles on two wheels. 2018-2019 winter was cold and wet in the Sonoran Desert. 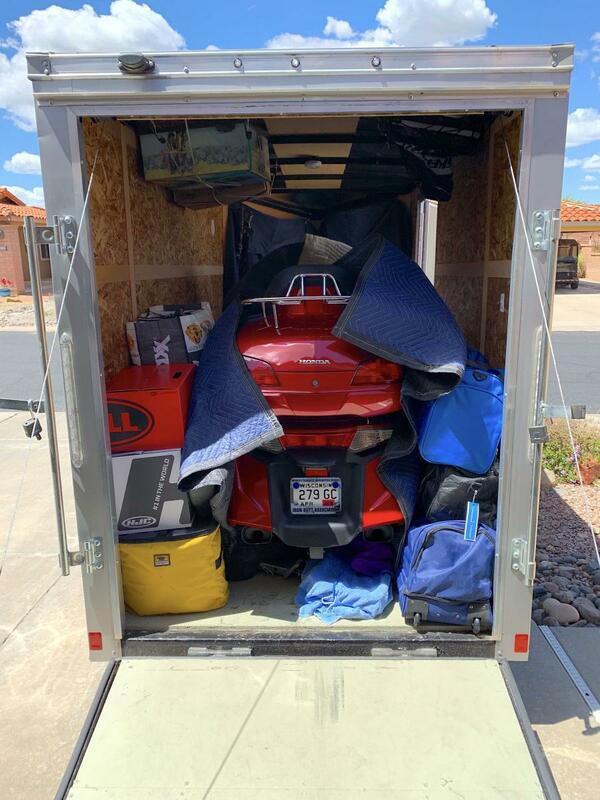 yeah, hate having to use a trailer, but glad I have one when needed. I needed to siphon out the Ethanol and put in Pure Gas, as the manual from Vespa in Italy loudly proclaims 93 octane unleaded pure gasoline only, no alcohol permitted. Really? it runs on 87 just fine, and I don't hear any knocking going on. but while down on vacation in Florida and Savannah, GA it declared it was thirsty and E-10 was all I could find. I will ride that out today I hope, and fill it with pure gas. Dirt Road Cowboy likes this. A Quetico Outfitter, who used Mercury Outboards, told me a story a number of years back about a test Mercury did, with their outboards. They ran two sets of their big outboards continuously, to see when they would fail. One set was running on E-10 and the other on pure gas. The E-10 set of motors eventually broke down. The motors running pure gas kept going so long that Mercury finally turned them off. My Honda sh150i is rated for 87 E-10, but like all my power equipment, it gets pure gas.